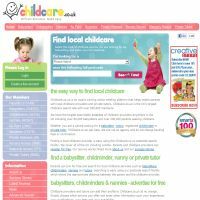 Childcare.co.uk offers a healthy range of features for anyone looking for a babysitter. They also cater for other types of childcare and also private tutors, midwives and maternity nurses. This top online childcare database describes itself as a "meeting platform". They also claim to be the largest childcare and private tutor search site in the UK with over 450,000 members. This breaks down into 70,000-80,000 babysitters and 200,000 parents seeking childcare. As usual, parents can join for free and use the search facility. Childcare providers can use the site by submitting a profile to the website for free. The search facility works by postcode and will show you babysitters in your area. There is a system of reviews by parents who have used the childcare services of those advertising on the site. The "babysitter" page begins by outlining the service and launches straight into the list of profiles, numbering some 86,617 results at the time of publication. These are ordered by the date they last logged in, so this gives you an up to date view of the website. You then have the option of an advanced search, or you can search by area through an alphabetical list at the bottom of the page. The profiles are fairly extensive and people are keen to say if they are registered childminders. The ones that have not been filled in fully stand out and this makes it easier to see who is committed to the job. Each profile shows all the usual criteria such as age, location and type of childcare they offer, but there is also the added feature of a rating system. This works by parents adding a review to the childcarer's profile and the number of reviews is displayed on the front of their profile. There is also a symbol indicating a negative or positive review, or neutral where there are no reviews. The reviewers leave their profile name on the review so you should be able to contact them if you want to hear more about their experiences with a particular childcarer. Used properly and with moderation, this is one of the most important features of this kind of website where you are essentially hiring strangers. This allows the human touch and enables people to recommend by word of mouth. The way to access this feature effectively is to choose the advanced search option and list the profiles in order of their rating. The profiles are not heavily reviewed, so you will find maybe 2 or 3 reviews maximum, but it still gives you a much better idea of the childcare providers. Other great features include free legal advice, which is not available on most of the other sites. The look of the site is functional if a little cluttered with advertising. Some childcarers are chosen by the website as featured profiles, so are highlighted for a better view. There is a page dedicated to publishing the latest reviews, which is useful to browse. Because it offers a reasonable range of simple to use, functional features and attracts a large number of candidates, Childcare.co.uk deserves to be in the top 3 at No1Reviews.com.